​Who or what got you started with the Friends? I signed up many years ago to be a volunteer cashier and to bring baked goods for the bake sale at one of the Friends’ Book Sales. I have been volunteering with the fall and spring Book Sales pretty much ever since then. How long have you been involved with the Friends/Library? It is hard to remember when I wasn’t involved, so I think it was soon after we moved to Belchertown in 1996. Whenever I move to a new place, finding the local library is one of my first priorities. I consider myself an avid reader. I look forward to participating in the Clapp summer reading program, which broadens the range of genres I read. What is your favorite part of being a Friend? Although I know they can be hectic, I truly enjoy the Members Only night and half-price Saturday at the Book Sales. The first night is like the opening night of a theatrical show with a huge cast of characters and many moving parts. I love it when someone finds the books they were looking for at such affordable prices and they go away with a big smile. I also like seeing the old, rare and unusual books that are often available at the Book Sales. What would you say to someone thinking about joining the Friends? Do it now and show your support for the Library in a very tangible way. It is a great group of people who share a love of learning and reading for all ages. The Friends provide such a wonderful community service by raising significant funds for our treasured library. Also, I have met folks in town with whom I might never have crossed paths otherwise. Do you have a favorite author and why? I have several, but I always read anything written by Michael Chabon. I love his descriptive style, quirky characters, and complex storylines. I am on the inter-library loan waiting list (another of my favorite library services!) for his most recent novel “Moonglow” and I look forward to diving into it. Do you have any suggestions for the Library or Friends of the Library? Just keep thinking of the different needs of the diverse segments of our community for materials, programs and services – children, teens, adults, elders, newcomers, speakers of other languages, folks with disabilities, etc. That makes our public library an inclusive, vibrant community resource for all of us. Who or what got you started with the Friends? My wife Alice and I moved to Belchertown seven years ago and one of the Friends Newsletters was delivered to our house. I guess the previous owners were members. I joined just thinking this was for a good cause, since libraries have been so important to me growing up and in my career. How long have you been involved with the Friends? I became involved about one year ago. I had been a member for a couple of years and donated to the library a couple of times. I think it was just time to become more involved and give back to the community in some way. Libraries have always been a place where I’ve enjoyed just spending time browsing the racks and finding new books to read and things to learn. The interactions with other members at the monthly meetings and learning about Belchertown from them. I really enjoyed working at the book sales this past spring and fall. Especially watching the kids pick out books. What would you tell someone who is interested in joining the Friends? I would tell them it is fun experience and a great way to meet people in your community. Do you have a favorite author or book? Isaac Asimov is probably my absolute favorite and “Childhood’s End” by Arthur C. Clarke ranks right up there as best book. I think I have read it at least five times. “A Canticle for Leibowitz” by Walter M. Miller, Jr. is a close second. Unfortunately, there are so many great books, that this is a very difficult decision to make. Do you have any suggestions for the Friends/Library? None that I haven’t already mentioned at the monthly meetings. I think this is an awesome group that does a lot for the library and community. I can only hope that I will be able to contribute in some small way to help the cause. 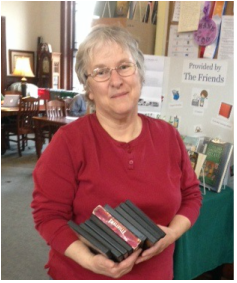 We moved to Belchertown in December 2014 and shortly afterwards my wife, Meredith Weiss, became a volunteer at the library. 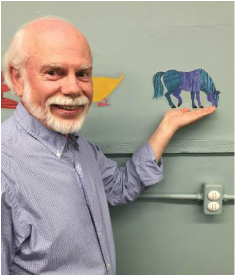 When I retired from my job as Director of Planning at Central Massachusetts Agency on Aging at the end of last summer I was looking for a community group to become involved with and the Friends provided a logical opportunity. When we were moving here we donated a number of books to the book sale and supported the sale by buying books for our grandchildren. We also attended the wine tasting event sponsored by the Friends in 2015 and joined the group at that time. However, I didn’t attend my first meeting until this past November. I haven’t been active for a whole year yet, but I enjoyed pouring wine at the tasting this past February and was happy to help with packing up the remaining books after the spring sale. We recently attended the African Storyteller program co-sponsored by the Friends with two of our grandchildren. We all enjoyed it immensely and it was a great experience to see the world through their eyes. It’s a wonderful way to give something of value to the community and to work with some great people who are similarly committed. I don’t have any particular favorite author or book but I’ve been a passionate reader since I was a child. As kids, my brother Wayne and I even used to read the encyclopedia for fun on rainy days. I’m primarily interested in non-fiction but still read the occasional novel or mystery. Polly Lindhult first recruited me for the book sales and I have probably been to most every book sale selling and buying! ​I have been a friend of the library since the 1980's. Currently I volunteer in the library shelving as many DVDS's as humanly possible! When my children were small I volunteered with shelving and covering books. I love the book sales , so many books so little time. The volunteers and the people who come to the book sales are so interesting! Being a friend is a great way to meet people and support the library- a place of many activities. I like historical fiction. I have spent the last year reading a series by Cynthia Harrod Eagles which consists of 35+ books. The series traces a British aristocratic family from the 1500'S on up through time, quite a feat. Recently, Friend's president (at the time), Paul Geoffroy, invited me to join the board. This is my first term. I have been helping with the book sales for about 10 years. Since then, I have met and worked with some wonderful people. My family and I joined the Friends as a way to show our appreciation to what our library has been providing for us as well as for the town. Growing up in Shanghai, China 30 plus years ago, I, liked the majority of the people in the city had no access to libraries. Any books we wanted to read, we had to buy ourselves or borrow from friends. Once in a while, some book vendors would bring a bunch of books to our neighborhood, set up a makeshift reading area on sidewalks. Kids would pay a few cents per book to read right there. As a little girl, I used to dream that I could go into a library to borrow lots of lots books. Now I have the opportunity to do so. My family and I have benefitted great deal from our library. I am a 'notorious' heavy borrower. Our almost 23 year old daughter grew up at our library story time. Every time, my husband needed a highly technical, hard find academic book, our library staff was able to get it for him. Friends works very hard to ensure that our library provides the town people with the best service its resources allow. My family and I feel good to be part of such an organization. This is our way to give back. We also enjoy meeting some wonderful people through the Friends. I am into thrillers and mysteries. David Baldacci is on top of my list.